This week we watched two black men be murdered by police, but no prayers came. There will be 305 more in the next 365 days. Time to demand change. During the attacks on Paris, social media sites were quick to change their profile pictures in or to done the flag of France. Not too long after that, the world was made aware of thousands of people killed by terrorists in northwest Africa, but the crickets were louder. Social Media sites made it clear who mattered. Since these same social networks don’t care enough about Black America to pray for us in our time of darkness, we must pray for ourselves; we must support ourselves; we must stand as one against the injustices that plague our communities. Change your Facebook or any other social media profile picture to show your support for Black Lives in America. Black Lives Matter. Be an Ally. I’m not Dr. Martin Luther King. I don’t have the platform to rally millions behind me. However, I am a writer. My passion is in developing software to enable people. 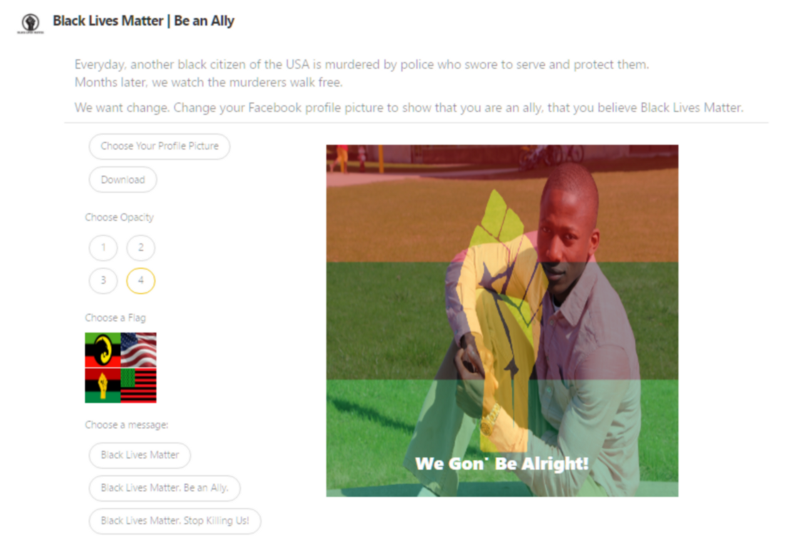 Since I am just one person, I took the time tonight to create a quick webapp to enable anybody who cares about the freedom of people of color (POC) to make it clear to their community that they support justice for all people by changing their Facebook profile picture. You don’t have to be black to be outraged. Remember that you don’t have to be black to have empathy for your fellow citizens. If you don’t know how to show you support the POC communities, feel free to change your profile picture in solidarity with us. Change your Facebook profile picture to show your support for Black Lives in America. Black Lives Matter. Be an Ally. Click here to create your picture. Via –Click Here To Change Your Profile Photo!! !